August 13, 2018, 2:00 p.m. This summer, seafood chain Red Lobster’s annual Crabfest was about more than just shellfish. In their marketing, the restaurant highlighted their relationship with the crab fishers from Discovery Channel’s popular reality show Deadliest Catch to showcase their commitment to sustainable fishing practices. The pairing served the restaurant well – data from YouGov BrandIndex shows the it had one of the highest bumps in Ad Awareness of the summer. 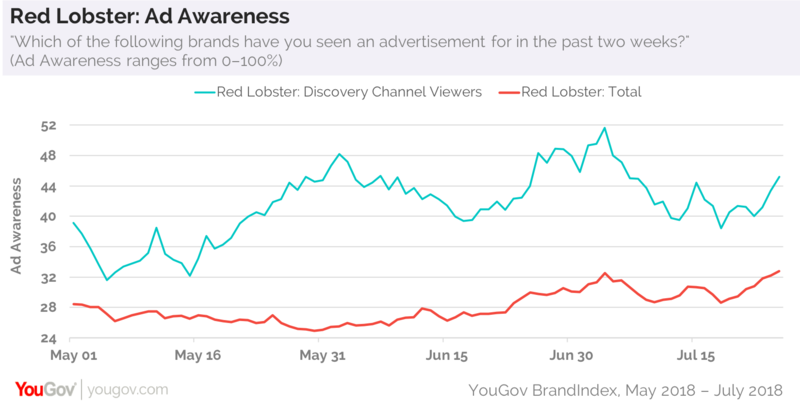 Red Lobster’s Ad Awareness score, which whether a panellist has seen an advertisement for the brand in the past two weeks, went from a low of 25 in May to a high of 33 in July. The bump was even more striking for regular viewers of the Discovery Channel. Ad Awareness amongst this group rose from a low of 32 in May to a high of 52 in July. Data from YouGov Ratings finds that Red Lobster and Deadliest Catch attract different fans. While Baby Boomers are the generation most likely to enjoy Red Lobster – 60% of Boomers have a positive opinion of the chain, making it their 19th favorite restaurant – it’s Generation X who have the most positive opinion of Deadliest Catch, with 40% saying they have a positive opinion of the show. Men are more likely to prefer Deadliest Catch than women, while women are more likely to like Red Lobster than men. 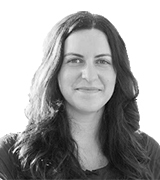 Learn more about YouGov Plan & Track.